Today we got three swatches of fabric that were particularly interesting. Upon walking into the studio, we were greeted by two tan colored textiles with the labels “lotus” and “banana” on them, respectively. Another one was a kapok fiber, one that we had seen, but would like to look closer at. These two, new fibers are very intriguing; I’ve never even heard of them before! With that, we decided to do a little digging into their production. Upon researching the banana textile, we found that it is not a new invention at all. People in Asia have used it for hundreds of years. Making its first appearance in the 13th Century, banana fabric is actually from the banana tree's stalk. The stalk contains strong, fibrous strands that can be made into anything from cloth that resembles hemp to fine silk. In Japanese history, the finest banana silk was used to make kimonos. As well as being durable, and a substitute for other fabrics, the banana fiber industry is also environmentally friendly. Farmers use banana stalks that the food industry considers waste products. Now the food industry is wasting one less resource. Also, pesticides and chemicals are not heavily used in banana tree growing. Banana textiles also an extremely moisture absorbent as well. Dyers do not have to use harsh dyes on the textiles, thus they are completely biodegradable. Onto the lotus fiber. It is surprisingly soft considering how rigid the fibers look. Never having seen lotus fabric before, we decided to do some digging on the production of this material as well as it's history. It turns out that the weaving of lotus fiber is an art form that originated in Myanmar centuries ago. The textile were used to make robes for the most exalted Buddhist monks. In Buddhism, the lotus is a very important and potent symbol; the roots in the mud rise up out of the murky water, into a blossom, mimicking the path of the soul out of baseness and into enlightenment. Like the banana fabric, the lotus fiber is made from the stem and stalk of the lotus plant; the stem is broken open and the fibers are taken out. The fibers are so delicate that no mechanical process can weave the fabric; it all has to be done on hand looms. The kapok fiber is something that we have seen before, but we did not know how interesting it was until we researched a little further. Like the previous textiles mentioned, kapok fabric is a natural, plant based fiber. What sets it apart is that it is not 100% kapok; kapok fiber is very fine, and any sort of weaving or processing would break the strands. It is usually combined with cotton, then woven into material. 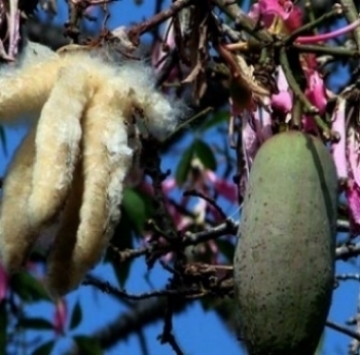 The kapok tree is native to Mexico, the Caribbean, Central and South America, and tropical West Africa. The tree has spikes all over it and grows pods, which contain the fibers. It is an extremely resilient tree that provides a large amount of fruit; this makes it an extremely promising renewable resource. Because the fiber is so fine, it is usually used as stuffing from anything to mattresses to insulation. The fiber is very buoyant, making it ideal for life jackets. We are very excited to be looking at these fabrics! We hope to be able to work with them in the future.